Greenhouse gas emissions in the EU contribute to accelerating climate change. 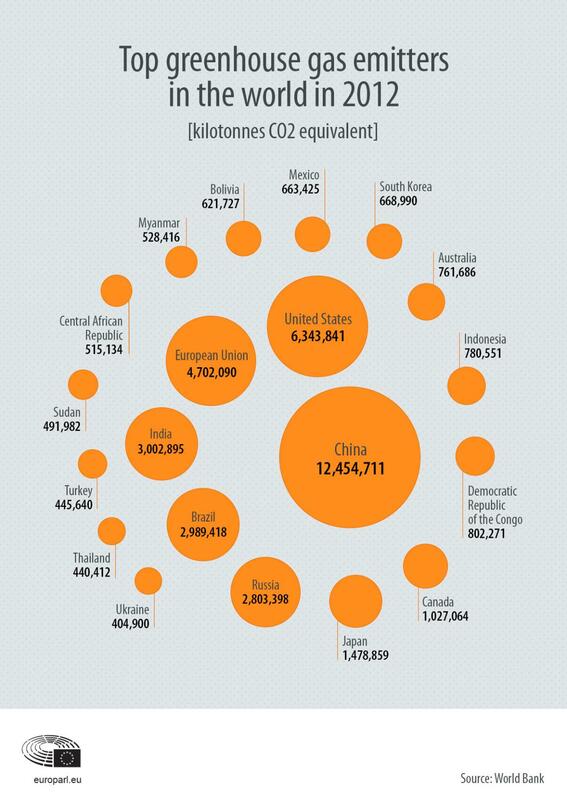 Whoare the biggest emitters? What sector produces the most emissions? 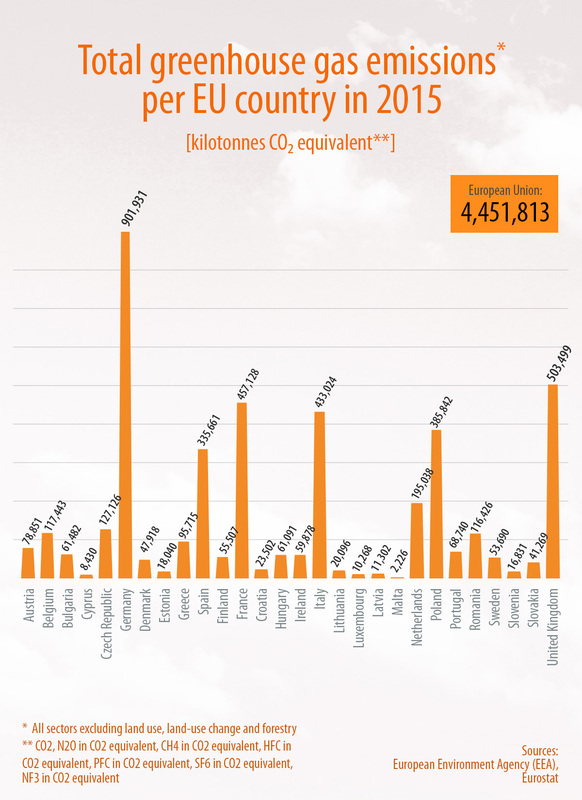 As the infographic above shows, CO2 is the greenhouse gas that is emitted the most. It is commonly produced by human activities. Other greenhouse gases are emitted in smaller quantities, but they trap heat far more effectively than CO2, and in some cases are thousands of times stronger. According to the fifth assessment report by the Intergovernmental Panel on Climate Change (IPCC), it is extremely likely that human activities over the past 50 years have warmed our planet. These activities include for example the burning of coal, oil and gas, deforestation and farming. The diagram above shows greenhouse gas emissions in the EU in 2015 broken down by main source sectors. Energy is responsible for 78% of greenhouse gas emissions in 2015, of which transport accounts for about a third. 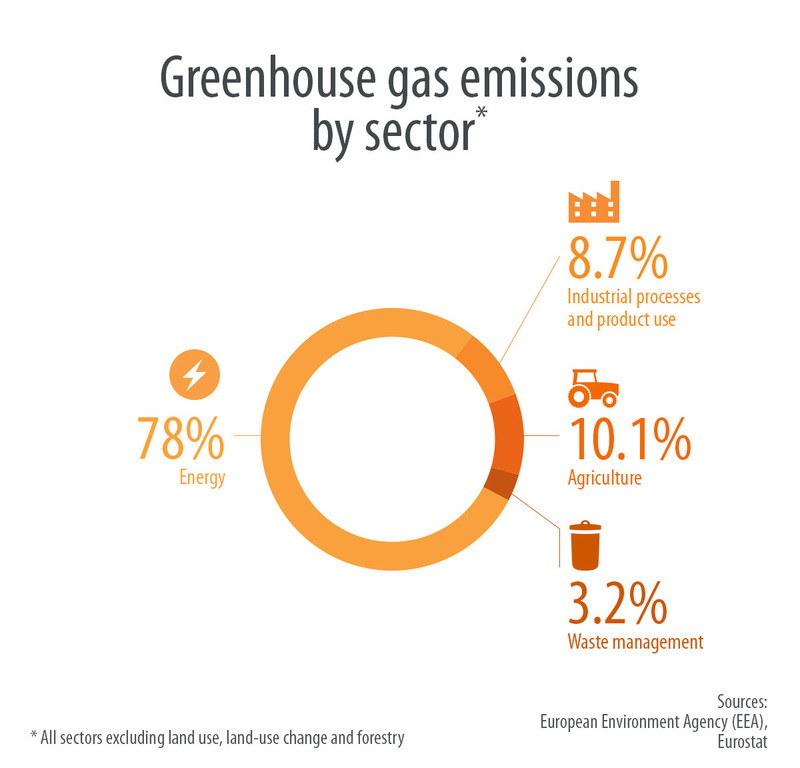 Greenhouse gas emissions from agriculture contribute with 10,1%, industrial processes and product use with 8.7% and the management of waste with 3.7%. The charts above list EU countries by total greenhouse gas (GHG) emissions in 2015 and the infographic below shows the world's top greenhouse gas emitters in 2012. 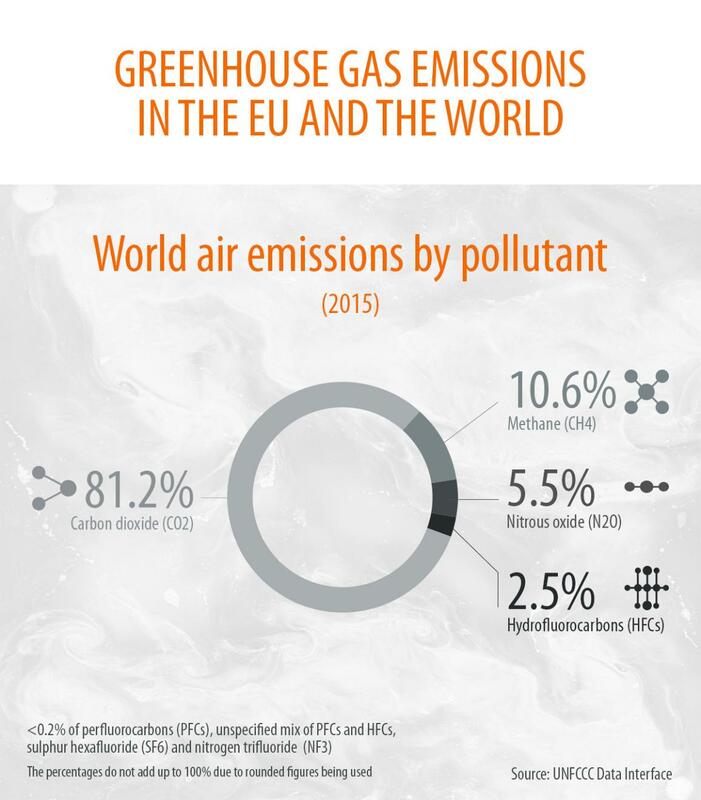 The EU is the third biggest emitter behind China and the United State and followed by India and Brazil. Greenhouse gases remain in the atmosphere for periods ranging from a few years to thousands of years. As such, they have a worldwide impact, no matter where they were first emitted. Greenhouse gases are gases in the atmosphere that act similarly to the glass in a greenhouse: it absorbs the sun’s energy and heat that is radiated from the Earth’s surface, trap it in the atmosphere and prevent it from escaping into space.